Gustavo has been a professional musician for 15 years. His worldwide recognition came through youtube with more than 7,000,000 of hits to date. He endorses several brands (Santo Angelo, Crafter, Nig Striwg, Landscape, Carvin, Basso Strap and Native Instruments) and through sheer talent, skill and stage presence, became Guitar Idol 2008! Daniele Gottardo took up guitar at the age of 14. His dedication to the instrument has won him many musical accolades and prestigious gigs with top pop singer, Alexia. His astonishing two-handed technique, dripping with heart felt emotion, has made him a sort after clinician and magazine writer. High quality instructional DVDs feature his trade mark incendiary licks and now Daniel is set to release his awesome debut CD, Frenzy Of Ecstasy. Ben was judged ‘Most Promising Young Guitarist’ at Guitar Idol 2008 and won £1000 from the national rock and pop exam board Rockschool. Ben had astonished the judges “with his level of technical virtuosity at such a young age, coupled with a level of phrasing beyond his years. For someone who has only been playing 3 years, it is nothing short of miraculous”. 22 / Newton Abbot, England. Jas has been called such things as ‘Future Guitar God’- Wishbone Ash and ‘A Rock Legend of the Future’ Planet Rock. Jas Morris began playing guitar at 13. Now 22, he has achieved such accolades as the ‘UK’s Guitarist Of The Year’ in 2003 and now a finalist of the epic International ‘Guitar Idol competition 2008’. ORIGIN: Rio de Janeiro, Brazil. Gustavo Di Padua releases his first solo album, entitled “The Stairs” in 2008. Already praised by the critics, this exceptional concept album represents each important step of his life. Gustavo also produced and played all the instruments on this album. The guitarist and musical producer started his career when he was 14 years old. Today, Gustavo has an ample musical experience and continues playing with important bands and Brazilian artists. ORIGIN: Sarajevo, Bosnia and Herzegovina. A highly experienced musician, Muris often plays and tours in his native Bosnia, and Europe. In high demand as a session musician, he has won a number of international guitar competitions and recently released his Debut Album "Let It Out". Muris is currently working on his second album and teaches online at GuitarMasterclass.net. Marc is currently lead guitarist in the rock band ‘Minnikin’. Since being a finalist in Guitar Idol 2008, Marc has made appearances on Local and National UK TV and also had International TV recognition from Japan, Korea, Argentina and Brazil! Fernando has an arsenal of mind-blowing techniques and a genuinely new approach to tapping, all of which has been substantiated by his place in the Guitar Idol 2008 finals and having also won Guitar World's ‘Best Youtube Guitar Video’ in 2007. ORIGIN: La Plata, Buenos Aires, Argentina. ORIGIN: Macaé, Rio de Janeiro, Brazil. André started to play the guitar at the age of 12. Playing the guitar then became his goal and he has since played in many Rock, Metal and Gospel bands. He has studied with many great guitarists in his city and after winning the “Kiko Loureiro’s No-Gravity Contest” in 2005 he moved to São Paulo to study at IG&T Brazil. He was selected for a Gibson contest in 2007 and then for the finals of Guitar Idol 2008 in London. 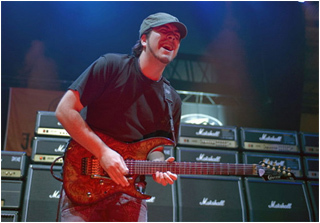 André is influenced by Joe Satriani, Kiko Loureiro, Steve Vai, Eric Johnson, John Petrucci and many others. He is currently looking for an opportunity to record his solo instrumental album. Guitar Idol 2008 was conceived as an online worldwide talent search to find the next generation of Guitar Heroes… and boy did it deliver! Already the biggest guitar competition in history, between March 21st 2008 and the Live Grand Final on June 14th 2008 almost half a million people visited, voted or entered the competition. On June 14th thousands of guitar fans witnessed 12 future guitar stars do battle with a crack live band on the main stage at The London International Music Show to be crowned ‘Guitar Idol 2008’. In late 2007 Alloutguitar.com, Licklibrary.com and the UK’s Guitar Buyer magazine sat down and decided the time was right to launch a new international guitarist talent search – one that for the first time utilised the Internet, by having contestants upload their video or audio entries at www.guitar-idol.co.uk to then be voted and discussed by guitar fans worldwide. With the massive resurgence of guitar playing, from metal to blues to the new acoustic masters, we all thought this could be big… but not this big! Visitors to the website crossed all cultural and national divides – not only from the US and Europe but places as diverse as Nepal, Iraq and Siberia! Finalists Gustavo di Padua, Gustavo Guerra and Fernando Miyata flew in from the ‘new home of shred’ Brazil, Peter Petchalov from Russia, Chris Feener from Canada, Muris Varajic from Bosnia and Daniele Gottardo from Italy. The UK was represented by Jas Morris, Tom Qualye, Ben Randall, the one-handed phenomenon Marc Playle and Lyle Watt, the 15 year wunderkind from North Scotland!